Below is a general size chart for the inventory we carry. Various lengths and thicknesses are available in most sizes, as well as several oddball size and very large size pipe options. 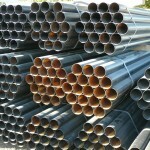 These include sizes such as 2″ OD, 12″, 16″, 20″, 26″, and 30″ pipe. We also offer used pipe in several sizes listed below (2-3/8, 2-7/8, 3-1/2), all of which have been machine cleaned to ensure quality that most used pipe sources cannot provide. Please call with any questions you may have.